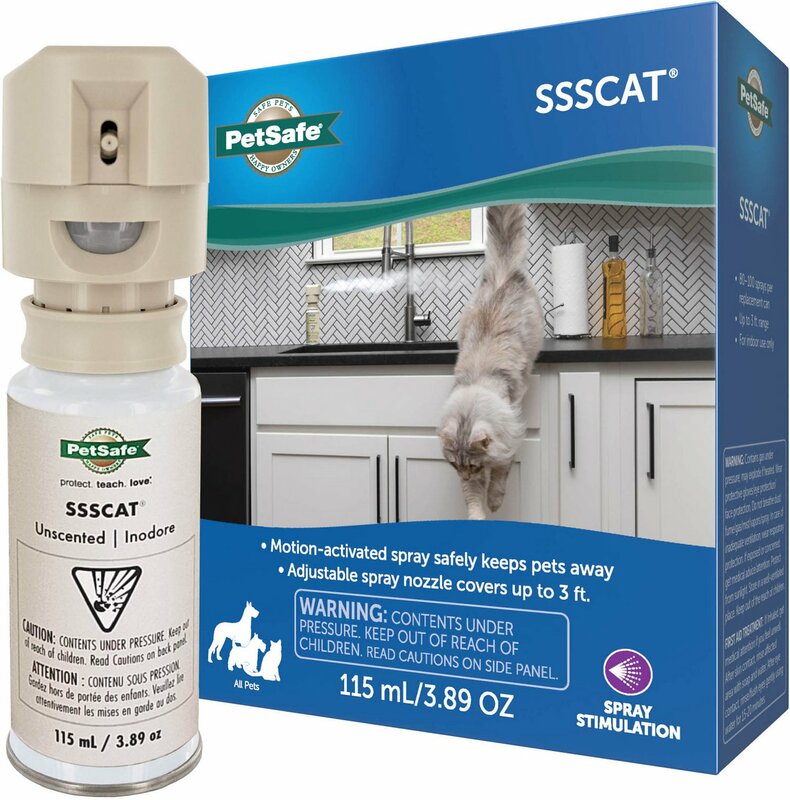 The PetSafe SSSCAT Deterrent Cat Spray easily protects indoor areas and objects from your pets. This unique spray uses motion-activated infrared to monitor movement up to 3 feet away. 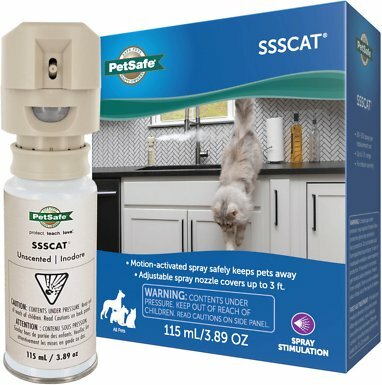 When the SSSCAT detects your pet entering an off-limit area, it emits a harmless, odorless and stainless spray to deter your pet from continuing. It’s great for keeping your cat off the counter, your dog away from the trashcan, or any of your furry friends from scratching or climbing on the furniture! Motion-activated spray safely and effectively keeps pets out of off-limit areas. Harmless but startling spray reminds your pet to stay away from the area or object. Adjustable nozzle allows you to cover up to 3 feet with odorless and stainless spray. Great for keeping pets off the counter, out of the trash, or away from belongings you’d like to protect. Requires 4 AAA batteries (not included) to keep your pet at bay. Motion Detector Unit, SSSCAT Spray Can, Instruction Guide. Contents under pressure. Keep out of reach of children. Place the deterrent in the area you want your pet to avoid. Protect your kitchen counters, new furniture, and potted plants or keep pets away from the stairs or kid's room. Turn on the spray and wait a few seconds for the Motion Sensor to stabilize itself. When your pet comes near the area, the Motion Sensor will detects your pet's movement. Your pet will feel a quick burst of harmless yet annoying spray. Your pet will quickly learn to stay away from this area. Add multiple sprays to create multiple pet-free zones in your home. The locking ring is removable. To re position it, line up the curved notch on the locking ring with the tallest straight notch on the refill connection point and lock into place. 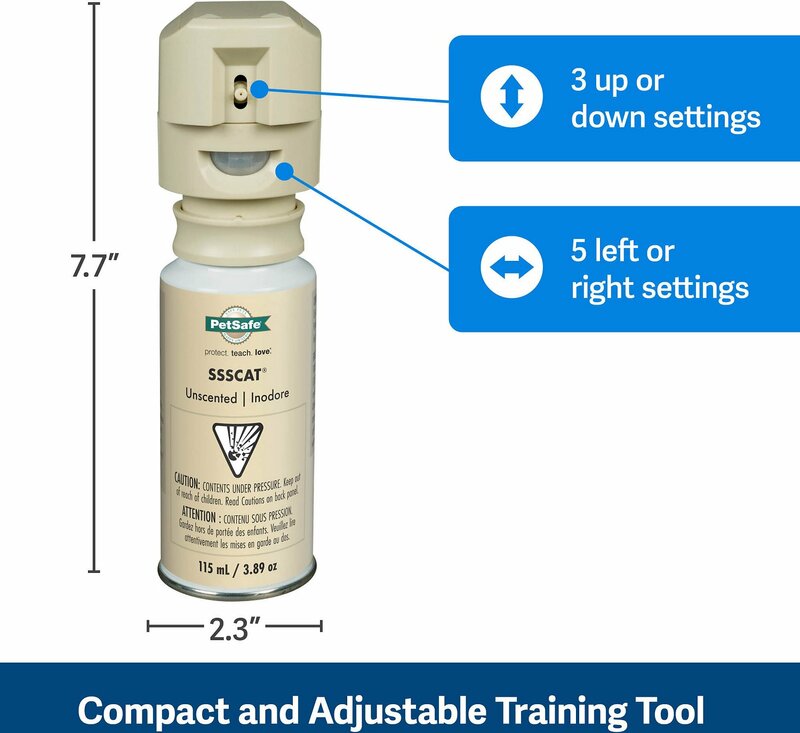 With the switch set to off ("O position), place the motion detector unit on top of the spray can and firmly slide down the locking ring until it clicks in place. To detach the motion detector unit, slide the locking ring up and pull the unit off the spray can. This does not scare the animal. The animal will get used to it and continue with its rambunctious ways. My dog knocked it off the counter (yes it was turned on), chewed on the ssscat and destroyed the head to the canister. The bottle itself was all but punctured by dozens of chew marks and we’ve been unable to find three of the batteries. One battery was found chewed on the floor. Go with the electric tape- that works like a charm. This really works. I just bought a new white sofa and didn't want my two cats scratching it or lying on it. I put the cat spray can on the sofa's arm rest and just one spray did it. My cats are very noise sensitive and it scared the heck out of them. If I don't turn it off when I am home it has scared me a couple of times. LOL! I highly recommend this product. In fact I bought two more! I bought this to keep our kittens off of the kitchen counter, especially since one of them jumps from the floor straight onto our flat-top stove. They definitely don't like the sound of it or getting sprayed. Like other reviewers have mentioned, you'll set it off walking by it, and it because difficult to use in high traffic areas while you are home. I turn it on in the kitchen when we are going to be gone. I've tried tinfoil on the counters, double-sided tape, and a static shock mat, and they all have their faults. This is the only thing I've found that works well for counters and actually startles the kittens enough to jump off. Happy- This works fantastic for my cats keeping them out of areas and rooms I do not want them in. Used them for years. Sad- There is no reason for this product be so expensive. As soon as any other company makes a device similar I will purchase it. I have recommended the item to my friends however none of them have purchased them because of the price. This worked after only one day to keep the cats off the kitchen island. Our kitchen island is 5 feet long, and we put it on the far end of it so the sensor would cover the whole island. It still goes off when we walk in front of the sensor 7-8 feet away. This was defeating the purpose because it would go off because of us and scare the cats who were no where near the counter. So we started turning if off when we weren't home. One can lasted us about a week, which is another complaint; paying 15 bucks for a can of air is insane! It worked, but it's pricey. Love the product! My cat recently decided that my curtins are for climbing. I installed a corner shelf for the device and it works great. My only criticism is the sensor is ultra sensative. The string to close the curtins is a good 6-8 feet away. I set it off all the time. It is a very humane way to train cats not to go where you don't want them. It only blows air at them! Definitely helped keep my cat off the counter! It doesn't always go off, but it went off enough times, even when he wasn't in there, which made it seem even more menacing because he learned that it'd randomly go off and he shouldn't risk it. I'm surprised at how long the spray has lasted, but we did have to take apart the top and clean it after a week because it stopped working, but it went back to normal after that. I'm glad we have it, and combined with keeping anything of interest off the counter, he's finally learning to stay off!